Nothing builds confidence in sports more than a winning season — especially when it’s your first season as head coach. After last year’s inaugural season, Rodenbo and Assistant Coach Chadd Fletcher have a lot of success to build on. 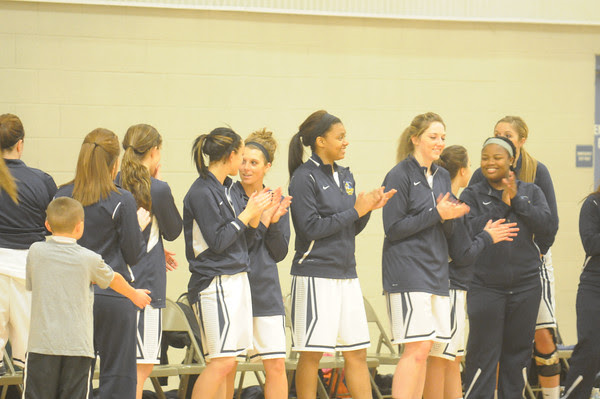 The team finished the season 20-6, and were the champions in Region 12. They lost in the National Junior College Athletic Association playoffs to Madison, Wisconsin, to end the season. Last year’s Lady Lakers cheer from the sidelines. “It was a very important year in that we were able to bring in players that could be successful at this level and establish our program, which will lead to future success,” Rodenbo said. Some highlights for the team were that they were third in the nation in three-pointers made as well as 11th in scoring in the nation for teams in their category. The team was also fifth in the nation in points allowed. “We were a very balanced team with four players averaging in double figures,” Rodenbo said, noting that Jo Hamlin averaged 14.7 points per game, Kara Hughston averaged 12.3 points per game and Erika Wendling averaged 11 points per game, while also shooting 51.8 percent from the field. Rodenbo cited some incoming players to watch, including Maddie Shurlow (Lakeview), Kara Schafer (Fowler), Ellen Twardzik (Calumet), Corinne Wezensky (Clare), Kalay Carter (Lansing Waverly) and Kristin Kullman (Evart). In addition to Hughston (McBain) and Wendling (Breckenridge), his experienced returners include Melissa Benchley (Clare), Tayaka Wallace (Flint Hamady) and Sarah Polena (Gaylord). The coach said he definitely expects the Lakers to be an up-and-down-the-floor team this season. “We will be able to put a lot of pressure on teams both offensively and defensively,” he predicted.